Written at 07:47:52 on Saturday, 9th December, 2017. Invoke a new tax on everyone. Allow stations to sell advertising time. Issue listener's licences for a fee. Perhaps do a combination of any or all of the above. During the first days of broadcasting everyone's set was sealed. This meant that a subscription was paid via a licencing fee and that fee was passed on to the station that listener's set was tuned to receive. It was illegal to retune the set as this meant breaking the seal placed on the set by the radio salesman. The sealed set scheme was doomed to failure because many people not only made their own sets and simply refused to pay the licence fee but such sets were able to be tuned to receive more than one station. In effect this was considered by the Commonwealth to be theft. In 1924, less than a year after broadcasting began, the sealed set scheme was scrapped and replaced by a simplified system where 2FC, 2BL (formerly 2SB), 3LO, 3AR, 5CL, 6WF and 7ZL were granted A Class status and the remaining stations around the country were classified as B Class. A Class stations were to receive revenue from Commonwealth grants made possible by licence revenue. B Class stations were permitted to sell advertising as their primary income means. This system, with subtle changes would last for another fifty years until it was abandoned a year after coloured television came to Australia. For the whole time that licencing was compulsory people tried to devise ways of getting out of paying their way. Hiding aerials in the roof space of their home, more powerful 'front ends' so that aerials were not required to being with and other sneaky tricks ended up being in vain as Commonwealth revenue protection agents rode the streets scanning dwellings for receivers. Then there'd be a knock at the door with a request to see the householder's licence. It didn't end there either. For each receiver a householder owned, there had to be a listener's licence. The rule of one licence per household was still some years away. Commonwealth agents used a device to measure RF frequencies generated by radio equipment which operated in a similar way to how radar detector detectors work. Reliability isn't great but when there is a signal coming from a house with no antenna, officers were entitled to be suspicious. There was, however, little way for officers to know that more than one receiver was being used in the same house without an inspection of the house. Another way for listeners to avoid detection was to use crystal sets - receivers that didn't use electricity to operate but merely soaked up radiation from the airwaves by the use of a crystal diode and a pair of very sensitive headphones. These, and for other reasons, led to a change in policy in licencing and from 1956 onwards, you could purchase a licence which covered both radio and television receivers in your home. During the 1930's those unlucky enough to be convicted of refusing to obtain a licence, there was a $40.00 fine waiting for them. Considering that the weekly wage was around $28 at the time, this fine was rather hefty - evasion was treated as a very serious offence in those days! Given that a licence for one receiver at the time cost around $4.00 (the price varied depending on distance from the closest A Class station) it is hard to understand why people chose to try their luck. 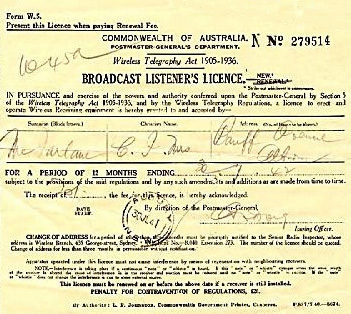 The era of the listener's licence came to an end in 1974 when the Commonwealth ordered an end to the scheme. Funding for the Australian Broadcasting Commission would come from consolidated revenue in future. 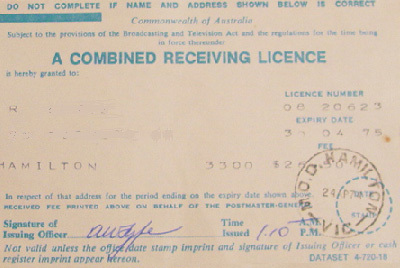 Below are a couple of examples of Australian listener's licences from days gone by. Some countries still employ listener licencing as a way of generating broadcasting revenues, one of which is Great Britain.